It’s official. 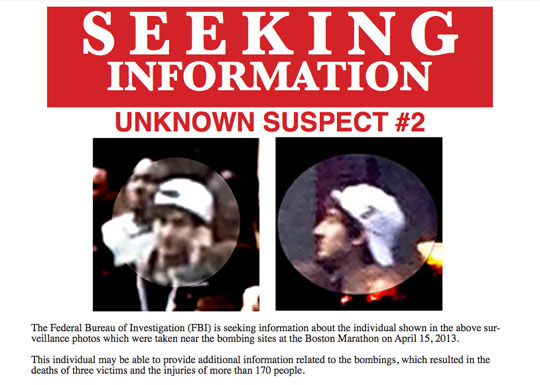 The FBI has released photos and a videotape of two men who are believed to be responsible for the Boston Marathon bombing on Monday, April 15. So now, the real hunt will begin. What will be forgotten about as time goes by will be the witch hunt that took place beforehand. 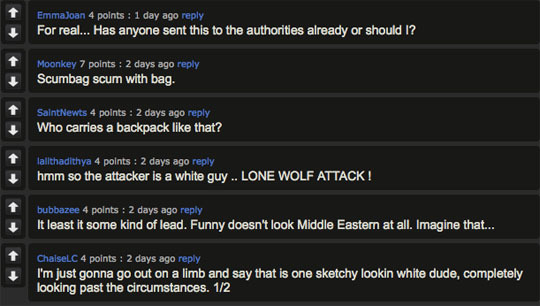 Who carries a backpack like that, anonymous imgur kiddie? A person who knows that when you’re walking in crowded areas with a backpack on that it’s easy for someone to rifle through it and steal your valuables. But you wouldn’t think of that because you’re busy hoping that the terrorist is a white Tea Party voter and a card-carrying member of the NRA. 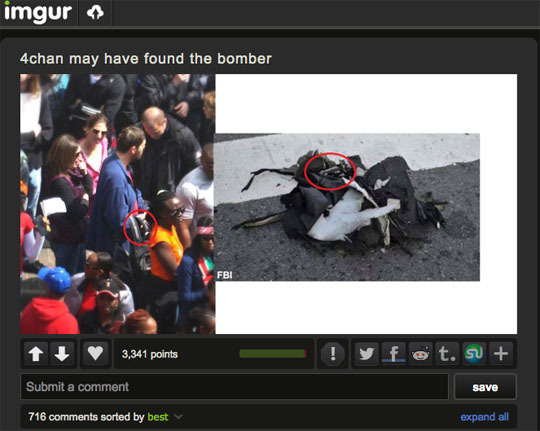 Want to know who the real “scumbag” is, imgur kiddie? The “scumbag” who looks at a still photo of a man standing in a crowd and is able to come up with all sorts of nasty narratives about who that stranger is and what motivates him. “White privilege is knowing that even if the bomber turns out to be white, no one will call for your group to be profiled as terrorists as a result, subjected to special screening or threatened with deportation,” writes author Tim Wise. “White privilege is knowing that if this bomber turns out to be white, the United States government will not bomb whatever corn field or mountain town or stale suburb from which said bomber came, just to ensure that others like him or her don’t get any ideas,” (David Sirota). 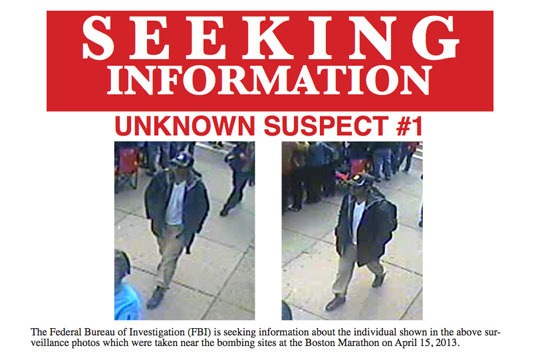 “There are new developments tonight in the bombing investigation here in Boston … But that investigation could be moving faster were it not for the successful lobbying efforts of the National Rifle Association. The NRA’s efforts to guarantee that American mass murderers are the best-equipped mass murders in the world is not limited to murderers who use assault weapons and high-capacity magazines. The NRA is also in the business of helping bombers get away with their crimes…” (Lawrence O’Donnell). Finally, we have publications like the NY Post, which are so eager to be the first out of the gate that they’re willing to look like complete morons by sending people after teenage track and field runners. 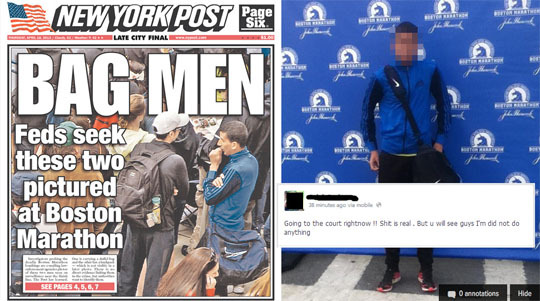 As Deadspin notes: [M]aybe there was a reason for them to be at the marathon, wearing track jackets and carrying bags: they’re runners. Why couldn’t the NY Post wait? The answer is not because they “wanted” it to be Arab-looking guys (like Salon explicitly “wanted” it to be white guys) — it’s because they wanted bragging rights. They wanted to claim that they were ahead of the pack, or that their sources were better than the next guy’s. In the age of 24 hour cable news and Twitter everyone feels as though they have to say something — now. They have to react immediately. They’re impulsive. They have no patience, and they’re so partisan that only moments after a horrific tragedy they’re penning pieces on “white privilege.” God forbid someone’s Twitter feed gets dialed down a notch until law enforcement agencies actually give users something to tweet about. I hope and pray that I never have to experience a terrorist attack up close and personal, but if I do I can assure you that I won’t be wondering if the person I’m applying CPR to is a Muslim or a Catholic, and atheist or an agnostic. And I promise that I won’t ask them if they voted for President Obama or Mitt Romney. These are sad times we live in. Sad times indeed. Update: The suspects have been identified and a manhunt is underway. Next Entry Did the media fail the American people on Abdulrahman Ali Alharbi? All of that is why I don’t have a Twitter and have been trying to cut back on Facebook…. can’t stand all the idiocy coming from various people who make unsubstantiated theories about various events and happenings. I wrote at my place on Monday how a liberal relative of mine went on a rant saying that she believed there was a “connection” between the bombers and Timothy McVeigh and Eric Rudolph. At the same time, she laughably told people not to “jump to conclusions” and “exploit the tragedy for partisan gain.” Another one of my relatives blamed Bush for the whole thing. Yeesh. And also my cousin lives in Boston, but thankfully he wasn’t anywhere near the Marathon and lives in a completely different area of the city, so that’s good. You should have asked your relative at which point in time she become clairvoyant, since she was able to see “connections” no one else saw. Or you could have congratulated her for seeing the “connection” that exists simply from comparing a bombing to … another bombing. How many residents of the lockdown area are now quaking behind locked doors wishing they owned a gun? Apparently MA’s very strict gun laws didn’t apply to the terrorists.